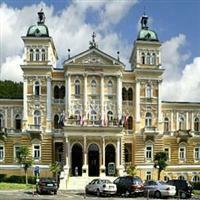 A prime location in the very heart of the historic area makes the Dhsr Nove Lazne Marianske Lazne a good choice for those who want to see the sights or enjoy the waters of the many springs and spas. The Spa Colonnade and Singing Fountain are both just steps from the grounds, and Caroline's and Ambrose's Springs are both nearby too. The Dhsr Nove Lazne Marianske Lazne is located at Reitenbergerova 53 which is 19.3 miles from the Karlovy Vary International Airport. Each guestroom in the Dhsr Nove Lazne Marianske Lazne is equipped with high-speed Internet access, a personal safe, a minibar, TV service, and a large private bathroom. Those staying at the historic Dhsr Nove Lazne Marianske Lazne will greatly appreciate the fine facilities and services, including the remarkable spa with massage and beauty treatments, a solarium, a swimming pool, a business service center, child care options, a sauna, an in-house restaurant, meeting and conference rooms, laundry and dry cleaning services, a modern fitness room, a lounge with bar service, airport shuttles, a tour desk, pet friendly policies, a concierge desk, banqueting facilities and 24-hour front desk service.